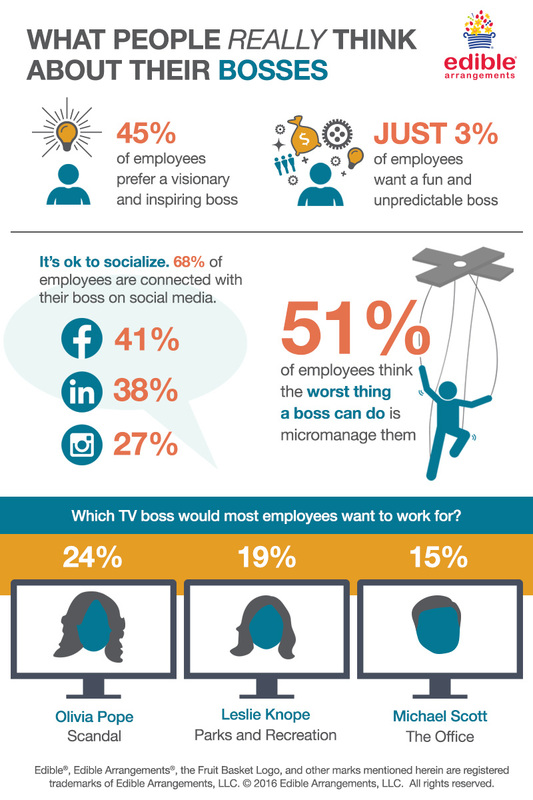 Home Business Gifting Infographic: What do People REALLY Think About Their Bosses? Boss’s Day is quickly approaching, and while we’ve been getting ready to help you gift #LikeABoss this year, it got us thinking – what do people really think about their bosses? To find out, we sent out a survey and got some pretty interesting responses. Check out the infographic below for some of the results! Whether you have a visionary and inspiring boss like Leslie Knope or a boss that has everything handled like Olivia Pope, show them your appreciation this Boss’s Day with a fresh fruit gift! If you’re taking your cue from Michael Scott’s infamous mug, our Best Boss Ever Gift Package is the perfect choice. Or, if you’re celebrating with your whole office, call Business Concierge at 1-800-691-3564 to order sweet treats for everyone to enjoy!